Sometimes, we make things harder than they need to be. At least, I know I do! The pruning aspect of landscape maintenance does not have to involve a significant amount of your free time. 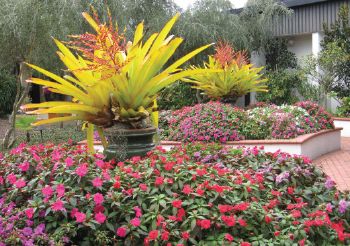 It is easy to reduce the pruning requirement by selecting the right plant for the right place in your landscape. By matching the mature height and spread with the space you have available, you can decrease time allotted to this step in landscape management. There are several reasons to prune plants, which include: train the plant to grow in a specific direction, stimulate flower or fruit production, promote more full growth, remove diseased or dead foliage, and safety pruning, which is to prevent damage to people and property. Shrubs can be pruned to control their size and remove dead material. Pruners, not hedge shears, should be used. Removal of crossing branches and renovation pruning, cutting back one-third of the plant, will improve the aesthetics and health of the plant. Summer blooming shrubs, such as Hibiscus, Oleander, Firespike, Roses, and Jacobinia, should be pruned when they are dormant. Spring flowering shrubs, such as Azalea, Indian Haw-thorn, Camellia, and Gardenia, should be pruned after the flowering has occurred and before the flower buds set/form for the next year. Annuals, plants that survive one season, not one year, can be pruned/deadheaded after the flowers have had their glory. This allows the plant to redirect its energy for growth and future flowers versus seed production. Tree pruning may be necessary to improve the shape or form. Pruning of deciduous trees, those that lose their leaves annually, such as Oak, Maple, and Hickory, should occur during the dormant season or just after the growth flush. Pruning at other times may promote undesirable sprouting. For assistance in pruning trees, utilize an ISA (International Society of Arboriculture) Certified Arborist whom you can find at www.treesarecool.com. Click on the tab titled ‘Choose a Tree Care Professional’ to locate those in your area. Appropri-ate pruning is beneficial. Crape Murder, however, is not. Please see the University of Florida (UF) publication, ‘Crapemyrtle Pruning’, by Gary W. Knox and Edward F. Gilman, at edis.ifas.ufl.edu/ep399. 3. Hold your arms straight out from your sides. That’s the horizontal position of 9 and 3 o’clock. In Central Florida, many ornamental grasses can be pruned in February or March, just before new shoot growth appears. Some perennials die back to the ground during winter. In this case, the dead plant material can be removed immediately. If plants are severely damaged or killed by a frost or freeze, pruning should wait until after the last chance of frost, until new growth is visible and you can determine the extent of the damage. The University of Florida has Gardening calendars available online for three regions in the state. These calendars contain month-by-month information on what to plant, when to prune, fertilize, etc. To view the calendar for your area of the state, see edis.ifas.ufl.edu/ep451 for the North Florida Gardening Calendar, edis.ifas.ufl.edu/ep450 for Central Florida, and edis.ifas.ufl.edu/ep452 for South Florida. The information in this article was adapted from a presentation created by Virginia Overstreet, UF/IFAS Extension Hillsborough County, where she is the Water-Wise Program Coordinator. As always, follow the landscape or architectural control procedures in your deed restrictions before making changes. 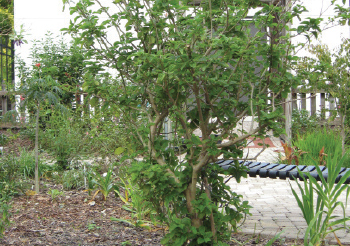 For more information about the nine principles of the Florida-Friendly LandscapingTM Program or for assistance with gardening-related questions, contact your local Extension office and/or visit the University of Florida website solutionsforyourlife.com or edis.ifas.ufl.edu. Did you know that UF/IFAS Extension offices are the gateway to the University of Florida/Institute of Food and Agricultural Sciences (IFAS)? Extension offices help apply the benefits of research and university expertise to solve problems in the areas of horticulture, agriculture, 4-H, and family and consumer sciences. Best Management Practices Certification, and pesticide applicator licensure. Some county programs offer on-site visits to evaluate landscape problems. Agriculture programs assist commercial producers of livestock, food, forestry products, and ornamental plants, trees, and sod. Agents diagnose production problems and train you how to improve pest management skills, how to use water efficiently, how to protect the environment, how to plan and manage natural resources, how to increase worker safety, and how to increase productivity and ensure food quality and safety. 4-H programs educate more than 200,000 youth enrolled in more than 100 different subject matter areas, reaching youth 5–18 years of age. Out-reach includes community clubs, day camps, overnight camping, school enrichment, and after-school programs. Youth in 4-H learn science awareness citizenship, leadership, healthy living, and work force preparation. 4-H youth have greater academic success, develop positive outside interests, and acquire life skills for work and family life as they transition from youth to adulthood. The life skills that 4-H youth acquire transcend into economic self-sufficiency, positive family and social relationships, and community involvement in adulthood. Family and consumer sciences program areas include parenting and family life, nutrition and health, and personal finance. Programs are offered at locations throughout the community for diverse groups. Audiences include employees in corporate workplaces, child care providers, and staff and clients of non-profit organizations. Parenting and family life topics focus on managing stress, parenting and child development, and child care provider training. Nutrition and health topics include food safety and preservation, managing diet to prevent or cope with disease, and menu planning. Personal finance topics include budgeting, credit and debt management, and saving for retirement. One-on-one financial mentoring is also available in many counties. You can find your local county extension office at: solutionsforyourlife.ufl.edu/map. Visit the University of Florida website: solutionsforyourlife.com or edis.ifas.ufl.edu. We provide solutions for your life.